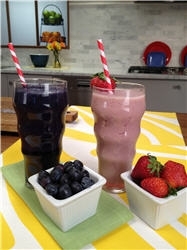 If you’re looking to shed a few pounds, this smoothie is a great meal replacement option for breakfast or lunch. The extra protein from the shot of protein powder gives you a burst of energy and helps hold you over until your next meal. In the winter months, fresh fruit options may be limited, so take advantage of affordable, frozen fruit — it’s perfect for smoothies. Some of my favorite fruit combos include: banana and mango, strawberry and peach, and triple berry (raspberry, blackberry, blueberry). *Note: For celiac disease, check the protein powder label to ensure it’s gluten-free.